The BRAI Pochette Porto Imprimé Fleur Indiennes Bleu is designed by Estelle Renard, of BRAI Paris, who draws her inspiration from the Californian lifestyle and the bright colors of India. 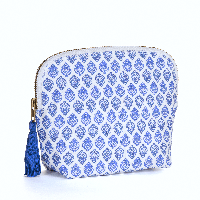 With its Blue "Pompon", the BRAI Pochette Porto Imprimé Fleur Indiennes Bleu is hand printed and makes a wonderful carryall that's great for the beach, picnics, concerts or wherever a purse or bag just wont due. Made from 100% cotton canvas. Interior lined with water-resistant nylon.